This is the first of three posts dedicated to The Rock Hudson Blogathon being held over at In The Good Old Days of Hollywood and Love Letters to Old Hollywood. Tnx Crystal and Michaela for letting me take part! Brief Synopsis – A platoon of British troops posing as Germans are sent on a mission to stop the Nazi’s advancement in North Africa. This film is actually quite good especially since it tries to take a real event and make it much more Hollywoodicized. 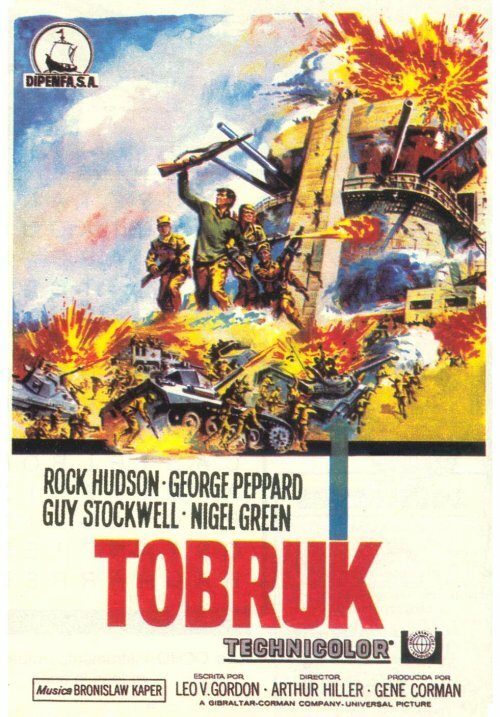 There were lots of battles fought between the axis and allies in North Africa and Tobruk was just one of them, but the added use of Jewish soldiers by the British in units that could infiltrate the German lines due to their own heritage is a unique idea to use since it is able to add so much to the standard action war film. Rock Hudson does quite a nice job in the lead despite the fact that there are too many points in the film where he feels like a carbon copy of Commander Shears (William Holden) from The Bridge on the River Kwai (1957). George Peppard is also used well here even though his appearance might make it seem strange that he is playing a Jewish soldier instead of a pure Aryan, but that is perhaps part of the point here. The use of a subplot dealing with Jews and their personal revenge on the Nazi’s is done in an interesting manner and actually allows the story to be seen from a deeper level because these men are not only trying to succeed in their mission for the sake of their homeland, but also for their religion and people. Bottom Line – Great idea that works quite well for what it’s meant to. The story is an interesting fabrication of the real events but they still manage to get some fascinating messages into this story by using unconventional elements to tell this kind of story. Hudson is great in the lead even though his character largely feels like a carbon copy of William Holden’s character from The Bridge on the River Kwai (1957). Peppard is also great here despite the fact that he looks more Aryan than Jewish, but looks can be deceiving. The subplot about Jews and personal revenge on the Germans adds an interesting level to the reasoning behind the mission and the pride that these men take in their mission goes beyond simple soldiers pride. Recommended! 1) Great call on Hudson being a “carbon copy” of William Holden in Bridge on the River Kwai. I said basically the same thing about Hudson’s “Colonel Caldwell” in A Gathering of Eagles; he borrows pretty heavily from Gregory Peck in Twelve O’Clock High. Haven’t seen this in a long time. I can’t say I was ever a huge fan, but it used to show up on TV quite often. Where do these movies go? Nice to the point review. I’m quite intrigued. I’ll have to add this to my to watchlist. This is a new-to-me film, but it does sound pretty interesting, especially since it was based on real events. Thanks for joining our blogathon!